Dental Implants are useful in cases where your natural tooth cannot be predictably saved. 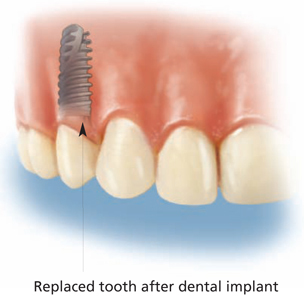 Dental Implants are also useful to replace a missing tooth. Research shows certain conditions must be met before an implant can be predictably placed so talk with your dentist about implants to see if they are right for you. In some cases additional surgery is needed to prepare a site for an implant. Nothing is as good as your natural tooth however dental implants have proven to be a very predictable treatment when your natural tooth cannot be saved or is already missing. 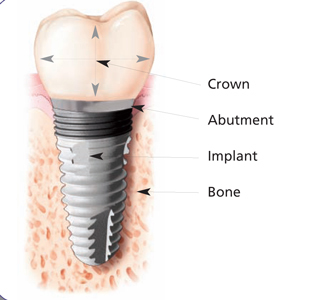 Dental implants need a crown after osseointegration. Endosseous Implants are placed underneath the gums into bone. After you have had an implant placed, a certain ammout of healing will be needed. During this time of "Osseointegration" bone grows around the implant stabilizing it's position. Every case is different and therefore no exact healing time can be quoted. After healing a crown will be needed over your new implant. There is alot of additional information you will need if you are contemplating this as an alternative to your natural tooth. Talk with your dentist about the timeline of Dental Implants before making any final decisions.